Oklahoma WR Dede Westbrook could be Doug Pederson's DeSean Jackson. Amba Etta-Tawo, WR, Syracuse (6'1, 204): Syracuse at Boston College, 12:30 p.m.
Etta-Tawo is second in the nation in receiving yards. He started off the season on fire, topping 100 yards in each of his first five games, but he has cooled off more recently. This is the first season that Etta-Tawo has produced, as he totaled 938 receiving yards in three years combined at Maryland before transferring to Syracuse. Etta-Tawo is a good bet to receive an invite to the Senior Bowl. The Eagles' need for more receivers is obvious, and Etta-Tawo could be good value in the mid-late rounds. Dawaune Smoot, DE, Illinois (6'3, 255): Illinois at (3) Michigan, 3:30 p.m. While the Eagles certainly have some pass rushers who have proven they can get to the quarterback, defensive end is a sneaky underrated need upcoming this offseason. At RDE, Connor Barwin has struggled to produce in Jim Schwartz's scheme, as he is a better fit in a 3-4 defense where his versatile skill set can be more effectively utilized. In 2017, Barwin will count for $8,350,000 against the cap, $7,750,000 of which the Eagles would save if he were cut or traded. (The Eagles would save over $6 million if they traded him before the trade deadline this year). Dawaune Smoot of Illinois is a less heralded player in this year's draft class because his team stinks, but he is an explosive, penetrating defensive end whose skill set would fit in well in Schwartz's defense. This is a player who will almost certainly receive a Senior Bowl invite, where he'll get more national exposure. Sidney Jones, CB, Washington (6'0, 181): Oregon State at (5) Washington, 6:30 p.m. In 2015, Jones had four interceptions, four forced fumbles, two fumble recoveries, 10 pass breakups, and two touchdowns (one on an INT, one on a fumble recovery). He's one of the lesser-known corners early in the draft process, but he's one of the best. Note that when the ball is in the air, Jones thinks it's his. He plays with a certain level of confidence that is ideal in an NFL corner. The Eagles' need for corners is obvious. If they can find a pair of good cover corners to go along with the talent on the rest of the defense, they can become a top five type of unit. Jones could be a guy who is in play in the back of the first round. 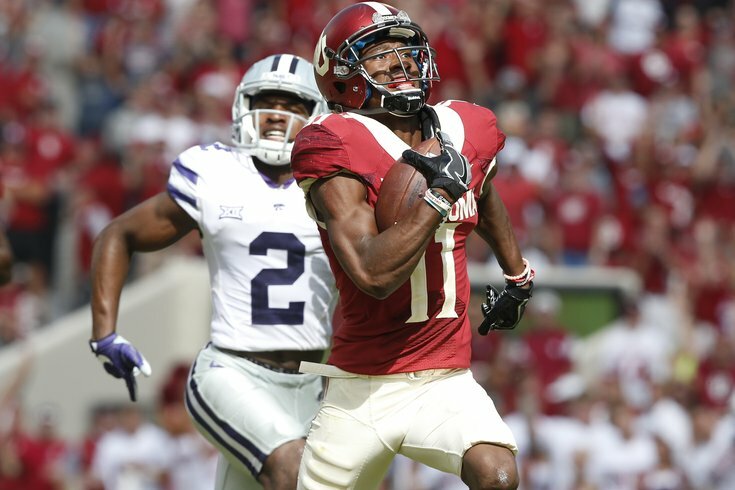 Dede Westbrook, WR, Oklahoma (6'0, 175): (16) Oklahoma at Texas Tech, 8:00 p.m.
Last week, DeSean Jackson said that he'd be open to returning to the Eagles. As we noted, last offseason, the Eagles tried unsuccessfully to add a receiver who could take the top off a defense. They signed speedy receivers Chris Givens and T.J. Graham, who both ran a 4.41 40 at the 2012 Combine. After Givens and Graham proved to be bad DeSean knockoffs (to put it kindly) in training camp, the Birds added 2016 undrafted speed receiver Bryce Treggs, who could not make the 49ers' final 53-man roster. The Eagles don't currently have a deep threat opposing defenses have to respect. Westbrook could be a good fit for the Eagles' offense, giving Carson Wentz a legit vertical option in the passing game, while also opening things up underneath for players like Jordan Matthews, Zach Ertz, and Darren Sproles. Evan Engram, TE, Ole Miss (6'3, 227): (23) Ole Miss at (25) LSU, 9:00 p.m. The Eagles already have three talented tight ends in Zach Ertz, Brent Celek, and Trey Burton, so why would they draft another one? Well, to begin, Doug Pederson wanted to keep four tight ends coming out of training camp, but Chris Pantale simply was not worthy of a roster spot. And so, the Eagles have rolled with three so far, and on occasions in which Ertz or Burton have been hurt, OT Matt Tobin has filled in at tight end. The Eagles are likely to add a tight end, whether that be in free agency, the draft, or as a priority undrafted free agent. The question is, would they add one like Engram high in the draft? Frankly, in my view, it doesn't matter if you want to label him a tight end, a wide receiver, or some kind of other offensive weapon. What he does is catch the ball, get first downs, and make plays. The Eagles don't have many players in their offense who do that.